There has been a revolution in ads about women in recent years tackling issues such as puberty, gender roles and health. In celebration of International Women's Day (8 March), Marketing, with help from social video experts Unruly, looks at the 10 most inspirational ads celebrating women. This ad from India went viral after Facebook's chief operating officer, Sheryl Sandberg called it: "one of the most powerful videos I have ever seen." It shows a father writing a letter to his daughter apologising on behalf of every dad who has set the wrong example by never doing the housework. The ad finishes with the line: "Why is laundry only a mother’s job?" This amusing advert encourages young girls to be whatever they want. Mattel is looking to empower females by allowing girls to imagine the possibilities from being a soccer coach, lecturer or a vet. Breaking out of stereotypes is the theme of this spot. It showcases a range of women and asks the question: ‘Have you ever thought I could never do that?". It urges women to throw it into another gear. 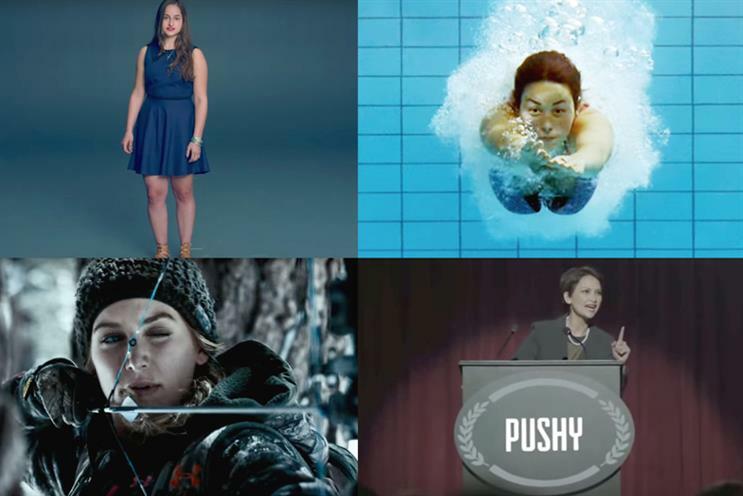 The groundbreaking ad #Likeagirl aims to give confidence to young women and fight female stereotypes. It asks young women to 'run like a girl', 'fight like a girl' and 'throw like a girl'. Then it asks young girls to do the same - with a different outcome. The ad asks: "When did ‘doing something like a girl’ become an insult?" This follows a girl from toddler to teenager showing how she has been dissuaded from getting involved in technology and science. It says: "Our words can have a huge impact. Isn’t it time we told her she is pretty brilliant too?" This humorous US ad deals with a girl's desire to be a woman, with hilarious consequences. To be part of the "cherry slush club" of girls that have started their period, one girl fakes it with Rubylicious nail polish. Her mother throws her a Full Moon Party, inviting all family and friends to celebrate. When she admits she faked it, her mother gives her the Hello Flo period starter kit. The make-up brand is about encouraging girls to take up the challenge to break barriers and turn 'can't' into 'can'. The spot shows celebrities Queen Latifah, Ellen DeGeneres, Sofia Vergara, Katy Perry, Janelle Monae and others fight against the statement "girls can’t". To show women ‘You’re more beautiful than you think’, Dove has a forensic artist draw sketches of their faces based on the view they have of themselves. It also asks someone else to describe their face, and their view was much more positive. The ad fits into Dove’s wider, ongoing campaign to make beauty a source of confidence, not anxiety. Sport England encourages women to participate in sport with the opening statement "I jiggle therefore I am". It tells women to forget about any of their bits that wiggle and to have the confidence to do whatever exercise they want to do.